Amid ongoing protests, by men and women devotees of Lord Ayyappa, across Kerala against the Supreme Court’s recent verdict that quashed the ban on entry of women aged between 10 and 50 years at the state’s Sabarimala Temple, a petition has now been filed in the top court seeking a review of the controversial judgment. 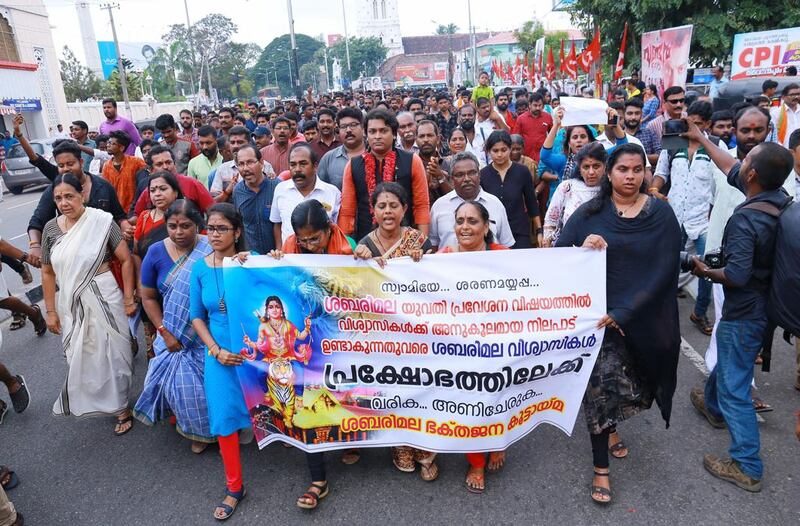 The National Ayyappa Devotee (Women’s) Association, on Monday (October 8), filed a review petition in the apex court challenging the Sabarimala verdict delivered by a Constitution Bench headed by Chief Justice (since retired) Dipak Misra last month. The plea, filed by Shylaja Vijayan, president of the association, called the apex court’s 4:1 majority judgment “absolutely untenable and irrational, if not perverse”. It may be recalled that the top court had, by a majority verdict, lifted the ban on entry of women at the iconic temple, stating that the centuries-old patriarchal tradition to disallow women devotees was against gender equality and constitutional principles. The sole dissenting opinion which upheld the ban had come from Justice Indu Malhotra, the only woman member of the five-judge bench, who had said that the there was no scope for rationality in matters of faith. The verdict, although hailed by feminists and liberals as a much needed reform against gender discrimination practiced at the Sabarimala temple, had immediately come in for criticism from the Ayyappa devotees, including a huge section of women worshippers. Street protests have since broken out across Kerala, drawing support from political and social outfits, even as chief minister Pinarayi Vijayan has repeatedly maintained that his communist government in the State would not seek a review of the Supreme Court’s landmark verdict. The priests of the Sabarimala Temple have also decided to skip a meeting called by Vijayan over the issue. “We have moved a review petition in the Supreme Court against the verdict. We will decide on the future course of action only after knowing the outcome of the review petition. Otherwise, the discussion with the government does not make any sense,’’ said Sabarimala Thantri Kandararu Mohanaru. He added that the decision was taken after consulting the leadership of the Nair Service Society, a prominent outfit of the socially and politically influential Nair community. RR Varma, a representative of the erstwhile royal family of Pandalam, too has extended support to the protestors, stating that the family wanted to protect the age-old traditions at the temple and was not interested in a discussion aimed at reaching a consensus on implementing the SC’s verdict. The review petition claims that the Sabarimala judgment has sent “shock waves among millions of Ayyappa devotees” and quotes an opinion by Supreme Court advocate Mathews J. Nedumpara as saying that the verdict “is a gross abuse of a procedure named “Public Interest Litigation” (PIL), which was evolved in early 1980s to render justice to the poor, the illiterate and ignorant who on account of their poverty, illiteracy and other disadvantages, are unable to invoke the jurisdiction of this Hon’ble Court under Article 32 and of the High Courts under Article 226 of the Constitution”. The petitioners also claim that those who had moved the top court seeking quashing of the ban on entry of women at the Sabarimala Temple were “not devotees of Lord Ayyappa” and so, had no cause of action in the matter.